For five days from May 30 (Mon) through June 3 (Fri), Hiroshima University dispatched Mr. Daisuke Ueda to Malmö University (Sweden) as part of the INU Staff Shadowing Program (*). Mr. Ueda is a staff member of the Library Information Planning Group, Department of Libraries, Office of Industry-Academia-Government and Community Collaboration of HU. Mr. Ueda’s work at HU involves the planning of services for University libraries. 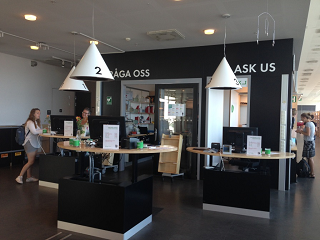 By attending the Shadowing Program, he learned mainly about the learning assistance and research support services provided at Malmö University libraries. 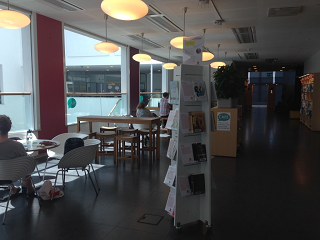 During the program Mr. Ueda was given a brief explanation about the library facilities by the Malmö University Library Director, and participated in discussions with library staff members regarding various services their libraries provide. In addition, on the last day of the program he gave a presentation in English on the facilities and services of HU libraries. So far, HU has dispatched nine staff members to foreign institutions while hosting eight persons from overseas countries. (*) What is the INU Staff Shadowing Program? This program aims to strengthen ties among the INU (International Network of Universities) member universities and to promote internationalization by providing the opportunity for administrators to study, discuss, and compare administration and governance systems across the network. Participants will normally spend one or two weeks with one or two different INU partners.